THE SUBJECT OF THE PHILOSOPHY OF ART IS ONE THAT SIMPLY ESCAPES MY MIND. ADMITTEDLY, I PROBABLY JUST DON’T HAVE DEEP THEORIES ABOUT IT. IF ONE LOVES CREATING PAINTINGS OR OBJECTS THEN IT IS SIMPLY WHAT ONE JUST DOES. I FIND GREAT PLEASURE IN EXAMINING A BEAUTIFULLY CRAFTED ARTWORK, BE IT PAINTING, SCULPTURE, CRAFT, OR UTILITARIAN PIECE. THIS OFTEN LEADS TO THE QUESTION OF HOW EXACTLY IT WAS CREATED. THERE ARE THOSE WHO SAY “OH! IT TAKES TALENT! I COULD NEVER DO THAT....I HAVE NO TALENT!”. MY THOUGHT IS THAT IF THERE IS SUFFICIENT INTEREST AND DESIRE THE SKILLS ARE LEARNED. IF YOU WANT TO GIVE IT A TRY, YOU JUST START! IF IT IS ENOUGH FUN YOU WILL KEEP GOING. SOME EARLY MISTAKES BECOME STRONG TEACHING TOOLS. YOU LEARN FROM THOSE MISTAKES BY DOING, AND OBSERVING, AND QUESTIONING, AND SLOWLY THE “TRICKS OF THE TRADE” LEAD YOUR HAND AND BRUSH. CREATIVITY IS NOT NECESSARILY “TALENT” BUT INTEREST, PRACTICE, DRIVE, AND LOTS AND LOTS OF STICKTOITIVNESS! TO ME, PAINTING IS THE TOTAL PLEASURE OF ATTEMPTING TO CAPTURE THE BEAUTY OR THE ESSENCE OF A PARTICULAR LOCATION OR SCENE. IT IS A MEANS OF FASTENING IT INTO A PERMANENT MEMORY. TRY IT! YOU TOO MIGHT LIKE IT! 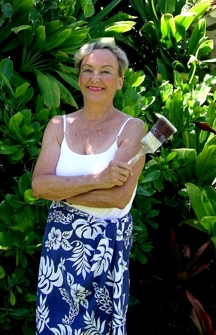 BORN AND RAISED IN HONOLULU, LOUISA DIVIDED HER TIME BETWEEN HAWAII AND CALIFORNIA, WITH SOME TIME IN SWITZERLAND, BUT PERMANENTLY RETURNED TO OAHU. SHE STUDIED ART HISTORY AT U.C.BERKELEY, AND EARNED HER B.A. IN STUDIO ART AT U.C. IRVINE.